How many brain cells are in your brain? The average adult human brain has about 100 billion cells. It’s still a mystery exactly how these connections work together to create all the marvels of our brains. The longest living cells in the body prize goes to brain cells. Most of our brain cells stay from birth to death. The wiring of these cells changes constantly through our lives. Brain do not have any pain receptors. Hence surgeons can perform brain surgery while you are awake. The pain experienced with headache/migraine is because of the pain receptors present in layers of coverings, blood vessels, the scalp and some muscles that surrounds the brain. Twenty-five percent of the body’s cholesterol resides within the brain. Without proper supply of cholesterol, brain cells die. The brain on an average is believed to generate around 50,000 thoughts per day. Sad part is that, in most people 70% of these thoughts are negative. The human brain is neither solid, nor liquid. It’s soft and squishy similar to the consistency of soft tofu or soft gelatin. And it’s very fragile. A single neuron generates only a tiny amount of electricity, but all of the neurons together can generate enough electricity to power a low-wattage bulb. The brain can survive without oxygen only for 4-6 minutes after which it begins to die. Lack of oxygen for 5-10 minutes can lead to permanent brain damage. Brain is only about 2% of human body weight, but brain cells use twice as much energy as other cells in body. Brain cells are always active, even during sleep. The brain processes complex stimuli during sleep, and uses this information to make decisions while awake. Researchers at the University of Rochester found that during sleep, the brains clear out damaging molecules associated with neurodegeneration. It’s a proven fact that people with high IQ (Intelligence Quotient), dream more. Scientists have discovered, that while everyone dreams, the frequency of dreams is significantly higher in those of above average intelligence. The right side of brain controls movements on the left side of body and the left side of brain controls movements on the right side. So if stroke affects the left part of brain, right arm or leg would get paralyzed. Learning new skills and doing mental tasks makes the connections between brain cells stronger. Staying curious can help it stay sharp forever. What raises chances of having a stroke? Diabetes accompanied with High blood pressure and smoking can damage blood vessels including those that supply your brain, raising the risk for a stroke. When you try to tickle yourself, the cerebellum predicts the sensation and this prediction is used to cancel the response of other brain areas to the tickle. A 1999 study of Einstein’s brain, based on photographs taken of it after he died in 1955, showed that the parietal lobes, which are linked to math ability, appear 15% wider than normal. But the size of his brain was a little smaller than average. Now your Brain knows a lot about itself…. I wish our Neurobiology classes in college were as much fun as this blog post! loved it . also the best part was brain grows faster in girls than boy and worse was the reason to heart attach as my husband is diabetic and smoke and his family has BP history. now i am worried . 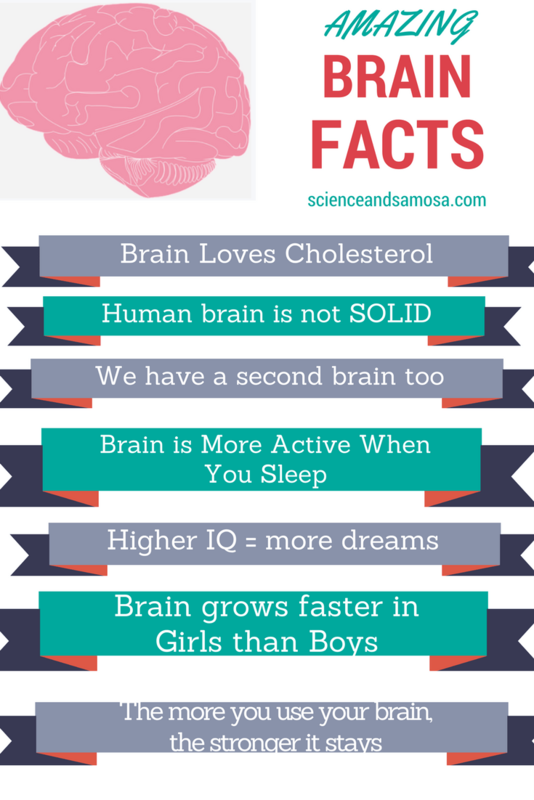 Those brain facts giving my head a spin now. LoL enjoyed it. Well yes my brain does know about itself now. Thanks for this wonderfully brainy post. That was a brain boggling post – such interesting facts. This is super Informative. I never felt science was boring ever, which many of them say :p till date. Many unknown facts are been mentioned above, thankyou for sharing. One recent incident, I lost my close loved one because of Brain Surgery not done properly 🙁 Thanks for sharing this dear. Happy to know that you liked my post. Sorry to hear about your personal loss. I did not know that brain does not feel any pain! Thanks for sharing! wow you have shared such cool facts. Some of them are new to me. Wow! Unheard facts! Loved them.. thanks for sharing this knowledge with us! Coincidently, I have added most of these facts in my recent school book too. Nice to know others too.